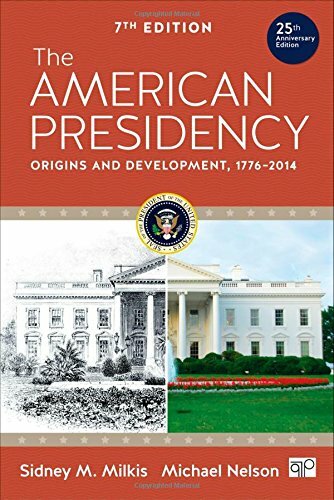 1483318699 -Authors Sidney Milkis and Michael Nelson look at each presidency broadly, focusing on how individual presidents have sought to navigate the complex and ever-changing terrain of the executive office and revealing the major developments that launched a modern presidency at the dawn of the twentieth century. By connecting presidential conduct to the defining eras of American history and the larger context of politics and government in the United States, this award-winning book offers perspective and insight on the limitations and possibilities of presidential power. In this Seventh Edition, marking the 25th anniversary of The American Presidency’s publication, the authors add new scholarship to every chapter, re-examine the end of George W. Bush’s tenure, assess President Obama’s first term in office, and explore Obama’s second term.